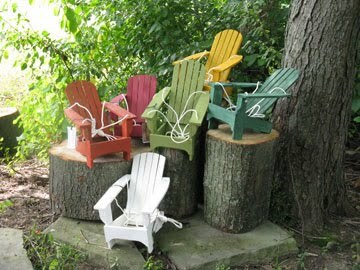 This charming miniature version of an Adirondack Chair functions both as a bird feeder and as a small hanging planter. We offer for purchase a separate wooden planter-box insert which fits inside the seat of the chair. We often sell these popular planters at shows already planted up with 2 or 3 different flowers, as well as small “Fairy Garden” versions Comes in white, pastel yellow, pastel green, turquoise, and lime green. Please specify color desired. Made in USA.